Following what has been a triumphant year so far for Rudimental, a UK Number 1 album and a prestigious 2013 Mercury Music Prize nomination. The Hackney based collective are pleased to announce a Platinum Edition of 'Home'. 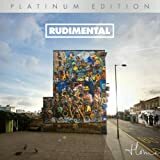 Home (Platinum Edition) features a brand new version of Free featuring Emeli Sandé & Nas as well remixes from the hottest new talents out there; including Kidnap Kid, Skream, Andy C and Gorgon City. Furthermore the repackage features a DVD all of Rudimental’s breath-taking official videos as well as a montage of Festival footage across the Summer and a live version of their new single ‘Free’.